An artist's rendering of an outburst on an ultra-magnetic neutron star, also called a magnetar. One of the strongest magnets in the universe, a magnetar, is unexpectedly capable of a strange new kind of glitch — a mysterious, unexplained drop in speed, researchers say. Unraveling what briefly put the brakes on this powerhouse's spin could help shed light on states of matter that scientists currently are not able to recreate in labs, scientists added. "Magnetars are really spectacular and mysterious objects," study co-author Victoria Kaspi, an astrophysicist at McGill University in Montreal and leader of the Swift magnetar monitoring program, told SPACE.com. "They can unleash extraordinary explosions and have the highest magnetic fields known in the universe, but they're relatively tiny, just the size of a city or so. How do they combine all that? We really want to understand them better." The magnetar 1E 2259+586 shines a brilliant blue-white in this false-color X-ray image of the CTB 109 supernova remnant, which lies about 10,000 light-years away toward the constellation Cassiopeia. X-rays at low, medium and high energies are respectively shown in red, green, and blue in this image created from observations acquired by the European Space Agency's XMM-Newton satellite in 2002. The explosions that give birth to neutron stars, including magnetars, crush them into some of the densest objects known, second only to black holes — a neutron star often packs as much mass as a half-million Earths within a diameter of only 12 miles (20 kilometers), and a teaspoonful of neutron star matter would weigh about 1 billion tons on Earth, approximately twice the combined weight of all the cars in the United States. This extraordinary mass gives a neutron star a powerful gravitational field as well — a projectile would need to fly at about half the speed of light to escape from its surface. Neutron stars can also spin as fast as the blades of a kitchen blender, up to 43,000 revolutions per minute. Past studies revealed hundreds of neutron stars can undergo changes in speed dubbed "glitches," in which the stars suddenly whirled faster. Now for the first time, scientists have discovered that neutron stars can abruptly slow down as well, a surprising irregularity currently unexplained by existing models of neutron stars. "We've dubbed this event an 'anti-glitch' because it affected this star in exactly the opposite manner of every other clearly identified glitch seen in neutron stars," said study co-author Neil Gehrels, the lead researcher on the Swift mission at NASA's Goddard Space Flight Center. Scientists focused on the magnetar 1E 2259+586, located about 10,000 light-years from Earth in the constellation of Cassiopeia, using NASA's Swift observatory to watch it from July 2011 to mid-April 2012. 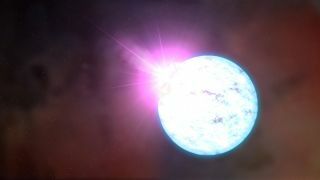 Ordinarily, the magnetar completed a revolution every seven seconds, but the researchers discovered it had later slowed by 2.2 millionths of a second. The extreme forces that matter in neutron stars experience theoretically gives rise to a host of bizarre, exotic phenomena that might explain regular glitches. For instance, researchers suspect the interior of a neutron star possesses, among other curiosities, a kind of frictionless state of matter known as a neutron superfluid. This superfluid is thought to make a neutron star's core spin faster than its crust, occasionally giving the crust bursts of speed that astronomers saw as glitches. Now scientists have to explain how anti-glitches might come to exist. "There was a huge outburst of X-rays from the magnetar a week before the anti-glitch was discovered, which does seem to suggest some process in its interior is responsible," Kaspi said. Pulsars and magnetars are types of neutron stars, the crushed core of a star that has exploded. Neutron stars crush half a million times more mass than Earth into a sphere no larger than Manhattan. Some of these objects spin at 43,000 revolutions per minute. One possibility is that a neutron star may have pockets of superfluids under its crust that each move at different speeds. These pockets could end up revolving more slowly around the neutron star's core than its crust, ultimately braking its spin in an anti-glitch. Another possibility is that internal vortexes of neutron superfluid that normally help drive the neutron star crust's movements could get driven inward by powerful concentrations of magnetic force emanating from the neutron star's core. Learning more about what causes anti-glitches might shed light on longstanding mysteries about matter under extremes. For example, matter in neutron stars can get squeezed to densities up to more than 10 times greater than in the atomic nucleus, far beyond what current theories of matter can describe. "Magnetars are the universe's strongest magnets and are some of the best laboratories we have for understanding pure physics," said study coauthor astronomer Jamie Kennea, an astronomer at Pennsylvania State University. "The extreme conditions on these stars could never be replicated in any laboratory here on Earth." Now that one anti-glitch has been discovered, further analysis of past findings might turn up smaller, less conclusive examples, Kaspi said. Future research, such as that conducted bythe NICER (Neutron star Interior Composition ExploreR) X-ray telescope recently approved to go on the International Space Station, might help discover more anti-glitches, Kaspi said. In addition, some existing models of neutron star glitches cannot explain some of the behavior astronomers have seen from them. A better understanding of anti-glitches might help solve these puzzles as well, Kaspi said. The scientists detailed their findings in the May 30 issue of the journal Nature. Follow SPACE.com @Spacedotcom. We're also on Facebook and Google+. Original story on SPACE.com.